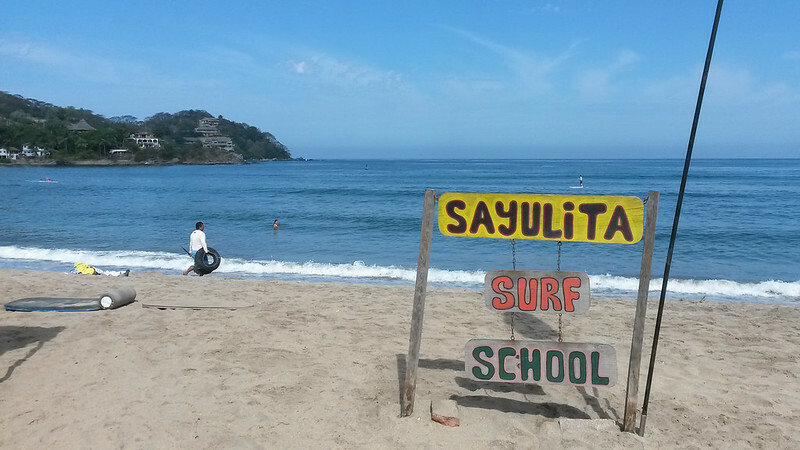 Another week in Sayulita. Working, studying, reading. 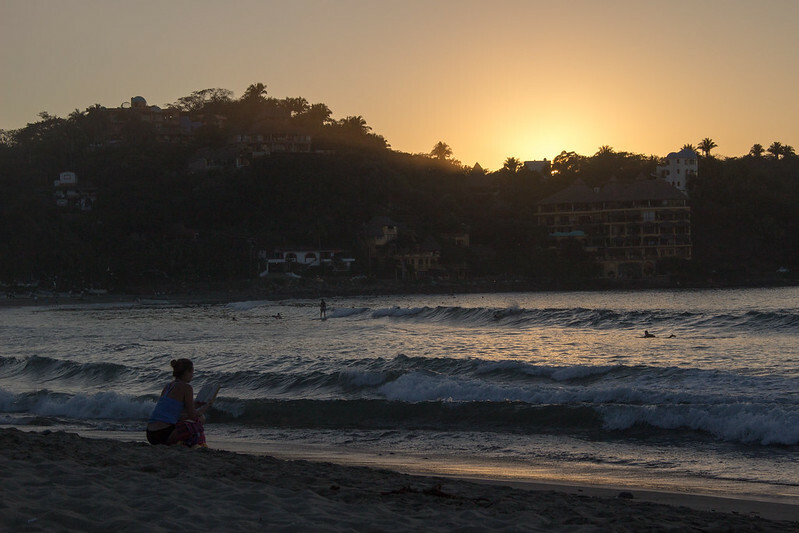 Eating street tacos, having long, relaxed weekend breakfasts in cafes, enjoying some beers at the beach at sunset time. Trying out Michelada (beer with tomato juices, spices, different sauces), not my new favorite. Taking a bus to supermarket in a nearby town, visiting the Friday market, doing yoga (=me) and surfing (=Antti), and listening some excellent live jazz. Welcome to our weekly recap! This one's for February 27th - March 5th, which for us is the week 9, 2015. 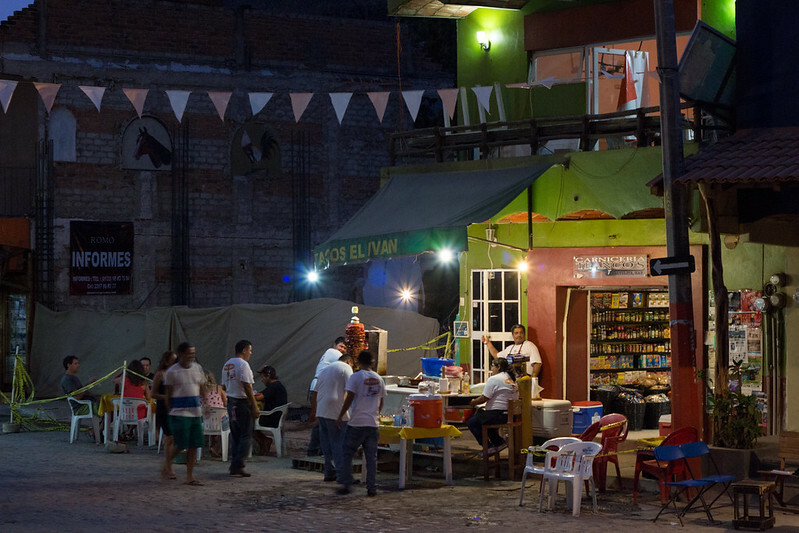 Food love: Street tacos! If you're not accustomed to buying your food from street stalls, it might seem suspicious, but you just gotta try them. The best thing (and one of the cheapest) in Mexico to eat! Just pick one that has plenty of other customers (preferably locals) around and looks decently clean. 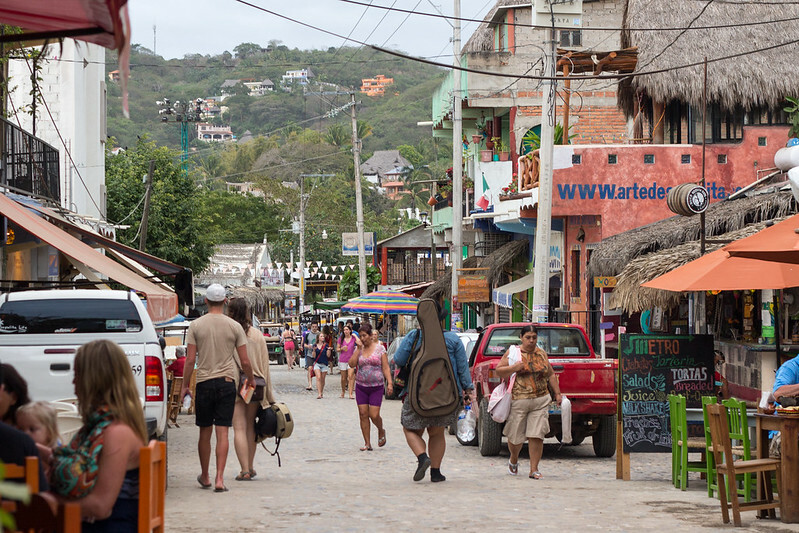 Tip of the week: The ATM's in Sayulita take a hefty service fee so withdraw cash (pesos) before you arrive! You can get some from the ATM's at airport, or from the banks in nearby bigger towns. 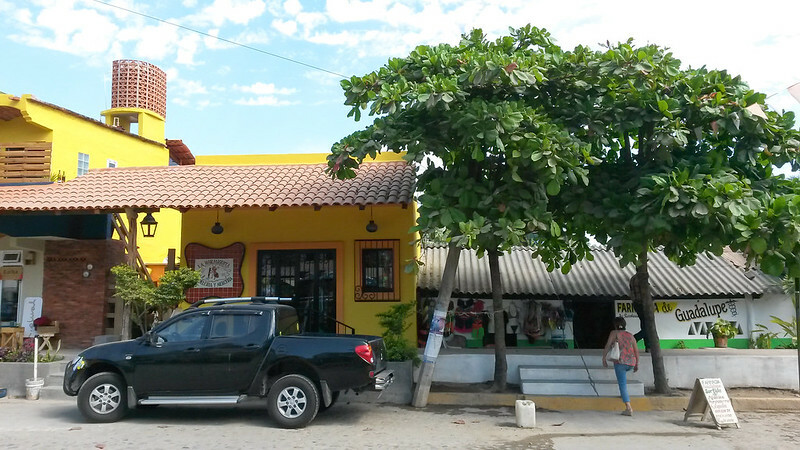 We withdraw money from an ATM inside a bank at Mega supermarket at Bucerias (service fee 35 pesos and no problems withdrawing 7.000 pesos vs. in Sayulita limit 3.000 pesos and fee 90 pesos). Small amount per se (savings ~9e), but these things do add up when travelling long term! Memorable moment: Sitting cross-legged, my eyes closed. I can hear the roosters, the cars, the sound of the wind. I can sense the other people around me at the palapa. I feel present and relaxed. My body is tired from the exercise but at the same time I feel energised. My life is good. I've been taking some yoga classes in the morning. I like walking to the place through the half empty streets, taking the time to relax and concentrate on the moment, and most importantly giving my sooo-out-of-shape body some much needed exercise. 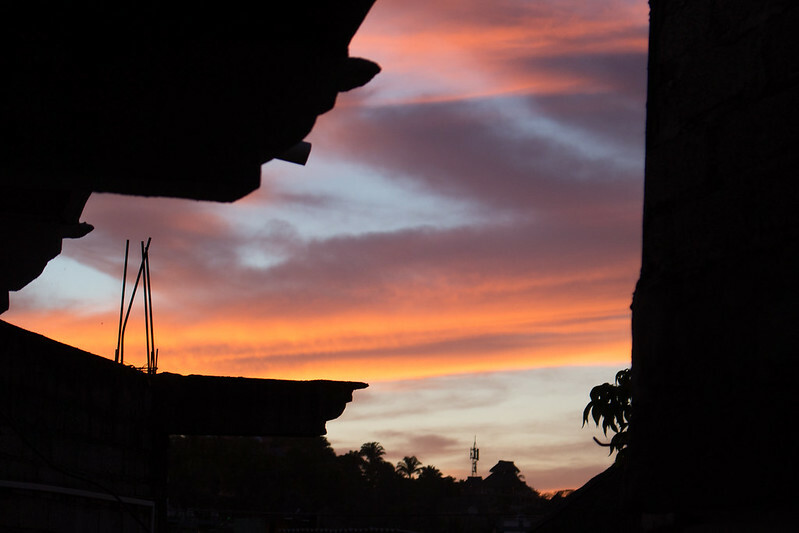 Random thought: The view from our outdoor kitchen/living room is somewhat limited, but we can still catch beautiful skies at sunset time. What I've learned: We have a few ideas on simple Android apps, and instead of getting someone else to do them for us I decided to freshen up my Java skills and learn how to make them. This way, even if we later employ someone to do them, we at least understand the concept. And it has been surprisingly captivating. I've been taking Coursera and Udacity courses, reading some books and trying out things in practise (I tapped my phone 7 times and I'm now a developer!). I wake up in the morning, and can't wait to to learn more. Surprise of the week: Going from no set plans for next couple of months to having flights, cruise and accommodations booked in just a few days was kind of a surprise. 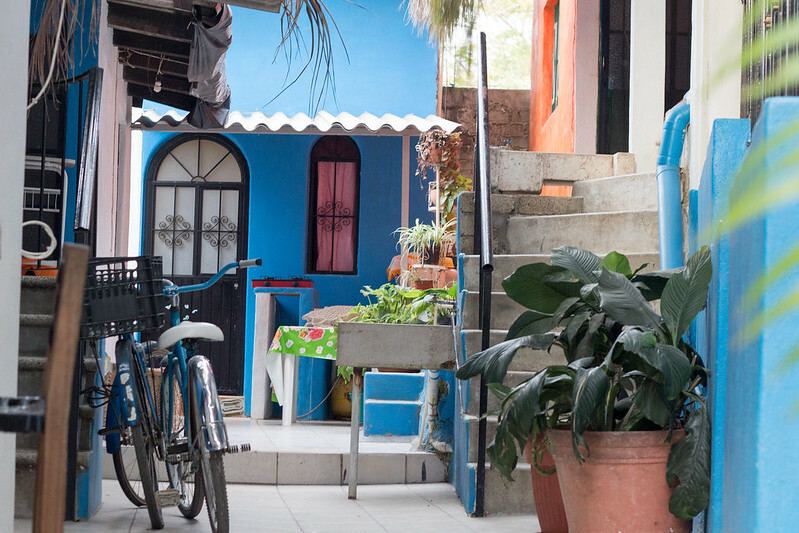 The plan is as follows: leaving Sayulita on March 20th (after a month here), stopping to visit friends in Mexico City for the weekend and then continuing to Cuba(!). We have a week there and we are planning to have a real vacation! No laptops and no internet (not that there would be many options). From there we fly to Cartagena, Colombia, where we'll have an Airbnb room for a week in the old town. I'm really looking forward to getting back to Cartagena, a city I still remember warmly from our visit in 2010. On April 7-16th we'll participate at the Coworkation, a "Collaboration Work Education Vacation for entrepreneurs, nomads, creatives, yogis and all of humanity in between. 10 days, 15 people, 1 unbelievable location and an unforgettable experience.. It just can't be nothing short of amazing. From Colombia, we fly to Fort Lauderdale and have a short 2-night pitstop in Florida. We have a car rented and our plan is to visit the Everglades National Park. Then it's time for another Transatlantic crossing, this time with Royal Caribbean Allure of the Seas, one of the biggest cruise ships in the world (and made in Finland!). This will take us to Barcelona, and that's where our plans end at the moment. Workwise: Vacation, what's that for? In couple of weeks we will have a vacation in Cuba and I have problems picturing it. What are we going to do with all the free time we have? I remember when I was still working 9-5, how much I looked forward to a vacation, how just a mere thought of it carried me through work days. But now I really like what I do, and honestly, I don't feel the need of having a vacation. Taking one day off once in a while seems enough. A non-cruise gal. Let's meet up. I'm doing the meet and mingle. Sign up for the meet and mingle. I'm neska1212.